OnePlus team has released the latest OxygenOS 2.1.1 OTA Update for the Oneplus 2 users. The new update comes with lots of bug fixes like Facebook, Maps and Messenger, and also comes with new language packs for Swiftkey keyboard. The update is neat about 44 MB and available via OTA method. To check the update go to your OnePlus 2 Settings > About Phone > System Update. You will see the update there, download it and install on your phone. 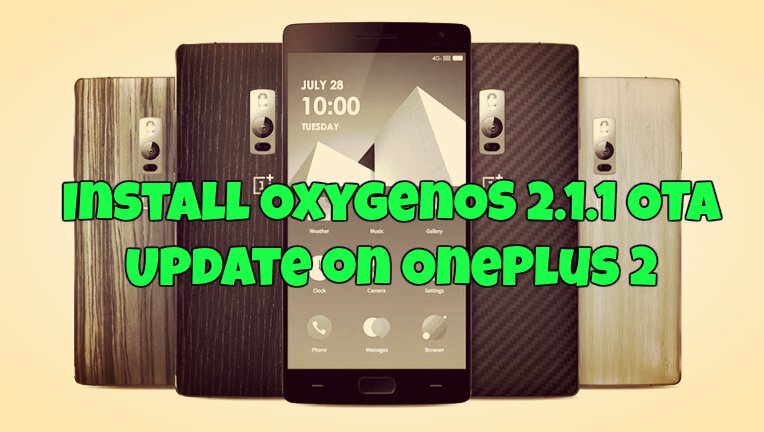 If you can’t see the OTA update there then wait for few more days to receive the update OR you can follow our below mention guide install the OxygenOS 2.1.1 OTA Update on OnePlus 2. The Guide is pretty simple and takes a few minutes to complete the process. This guide is only for the Oneplus 2 user and don’t try this method on Oneplus One phone. Here in this guide we’ll show you how to flash the OxygenOS 2.1.1 OTA update non-rooted Oneplus 2 with Stock recovery and Rooted Phone with TWRP recovery. Before following this guide do take the full backup of your phone, in case something goes wrong then you can restore your backup. NOTE: – TO apply this update your phone should be on Oxygen OS 2.1.0 version. Method 1. For Non-Rooted Oneplus 2 user with Stock Recovery. Step 1. Download the OxygenOS 2.1.1 OTA Zip file here and move the zip file on your phone internal memory. Step 2. Boot your phone in recovery mode. See here how to boot Oneplus 2 in recovery mode. Step 4. Browse the OTA zip file that you saved on your phone in Step 1 and Install it. Voila! You phone is running on the OxygenOS 2.1.1 version. Method 2. For Rooted Oneplus 2 users with TWRP recovery. Step 1. First You have to unroot you device, To do this flash 2.1 Oxygen OS on your phone. Download the zip file and saved on your desktop. Step 2. Download the OxygenOS 2.1.1 OTA Zip file here. Step 3. Once both the files are saved on your phone. Boot your phone in recovery mode. See this how to boot phone in recovery mode. Step 5. Now Flash the 2.1.1 OTA update zip file. Enjoy now your Oneplus 2 is running on the latest OxygenOS 2.1.1 update.